On hosted Bitcoin wallets such as- Coinbase or Bitcoin exchanges like Binance, Kucoin, Bittrex, Bitfinex or Poloniex. If you don’t know, consider reading this guide on the- MtGox hack, and private keys. Compatibility- – The wallet should be compatible on different operating systems. Ease of use- – Elegant user interface for quick and easy use. Developer community- – Active development community for maintenance, ideas, support, and help. Backup and security features- – Pin codes and seed backup keys. Control private keys- – You need a wallet where you own and control your keys. When it comes to the best NEM wallet Android and iOS devices support NEM Mobile Wallet software– it features a simpler interface and navigation. The application is free and perfect for managing your NEM accounts. Security options are up to the mark: the app supports multi-signature functionality, which means you can store and encrypt your private keys and other crucial data right on your device. The speed of transactions is fast, though some users reported facing problems and bugs. The NCC wallet comes with advanced features and is good for harvesting your XEM coins. The wallet works in Windows, Linux and MAC operating systems. It is advisable to users to check their computers from any malware or viruses before installing this wallet. NEM Nano Wallet is perhaps the best options of NEM wallets out there. It’s easy to use, compatible with all the important platforms and OSes (Windows, macOS, and Linux), and has good security features and hardware wallet integration. It allows you to store, manage and send XEM, as well as send mosaics and messages to any address or namespace. The wallet also allows you to create on-chain multi-signature and multi-user accounts. Needless to say, you are always in control of your private keys. Back in 2017, the team behind the wallet added Trezor integration, allowing you to securely store XEM tokens using the popular hardware wallet. Trezor is the world’s first Bitcoin hardware wallet. Presented by SatoshiLabs, a Czech Republic-based company, Trezor has a reputation for providing top-notch security, protecting against both physical and virtual theft. Trezor is a small device with an OLED screen. It connects via a USB to your personal computer or phone. This wallet is the perfect solution for storing a large amount of Bitcoins in order to keep them out of harms way, and its fundamental purpose is to store your private keys offline and sign transactions. What Trezor lacks in style, it more than makes up in the security department and it sets the gold standard for crypto security. The initial setup of Trezor is a bit different from the Nano S. Here is a full guide and review of Trezor hardware wallet. 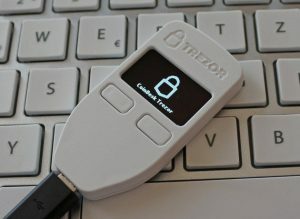 With Trezor, when you first connect it to your PC, it shows a- nine digit pin- code on its OLED screen, and you need to enter the same pin code by clicking on your corresponding PC screen.- This code is generated randomly every time you connect Trezor, and makes sure that even if your PC is compromised with malware, your private keys will still be safe with Trezor. You will be asked to write your 24-word recovery seed after entering the pin. Again, your recovery key is the only way to restore your Bitcoins, which means that you need to keep it. It’s important to note that an additional passphrase can be added to the 24-word seed, which provides extra protection, because anyone who finds someone else’s 24-word seed is free to access the funds. If the optional passphrase is added, then an attacker wouldn’t be able to access funds without both the passphrase and the seed. The passphrase cannot be recovered if it is forgotten. After that, using Trezor is pretty similar to the Ledger. Trezor is currently available for OS X (version 10.8 and higher), Windows (version 7 and higher), and Linux. It can also be used with Android devices. It can be used with apps such as Multibit HD, Mycelium, and- TREZOR Wallet. It costs $99 and is available in 3 colors – black, white, and gray. Pros: Supports additional wallets and altcoins, easy to use and intuitive interface, extremely secure wallet. Cons: Expensive relative to its competitor. The post Best Nem (XEM) Wallets – 2019 Edition appeared first on CaptainAltcoin.